Anthrax is a serious disease caused by the bacteria Bacillus anthracis. Anthrax occurs naturally in cows and other herd animals. It can be transmitted to humans who come in contact with infected animals or animal products. Anthrax is considered an effective bioterrorism agent because the bacterial spore (dormant form) is highly stable and storable, and because of the disease's relatively high lethality. Various strains of anthrax exhibit different levels of lethality. Delivery: Humans can become infected with anthrax in three ways-ingestion, inhalation, and cutaneous (skin) exposure. A deliberate anthrax attack, however, would likely rely on inhalation since it is the most deadly. Finely milled powder and aerosolized spray anthrax are easily inhaled. Production: While cultivating anthrax from naturally occurring sources is relatively simple, producing an effective weaponized form is technically difficult. The anthrax spores must be specially processed to prevent clumping and allow for greater inhalation leading to a fatal infection. Historic Use: In 2001, the United States experienced an anthrax attack in which weaponized anthrax was delivered via the postal system. Japan used anthrax in WWII in China. In 1979, accidental release of anthrax from a lab in the Soviet Union killed over 60 individuals. 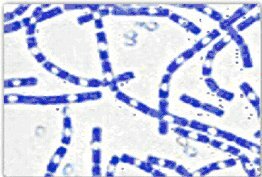 Mechanism: Once in the body, anthrax becomes active, multiplies, and releases a three-part protein toxin of which one part is deadly to humans: the lethal factor. The lethal factor interferes with the normal functioning of the body's immune system cells. with an itchy bump that develops into a black sore, sometimes accompanied by flu-like symptoms. Ingestion of anthrax (for example, via contaminated food) causes food poisoning-like symptoms and can be fatal. Inhalation anthrax is the most serious form-mild respiratory symptoms develop into severe symptoms, breathing difficulties, shock, and eventually death if not treated. Symptoms normally appear within a week of exposure, but may not appear for 2 months. Treatment: While a vaccine for anthrax exists, it is only available to those who are at risk for anthrax exposure, such as the military. Generally, anthrax is treated with a course of antibiotics as soon as symptoms appear or before symptoms appear if exposure is suspected. If treated promptly, anthrax infection usually responds well to antibiotics; however, treatment provided in real-life circumstances is likely to be imperfect-the 2001 anthrax attacks resulted in a 45% fatality rate (5 deaths of 11 infected).